WINSTON-SALEM, N.C. (April 15, 2015) – The Childress Institute for Pediatric Trauma and the Matthew Gfeller Foundation are partnering to host two free Kids & Pros Heads Up football clinics led by former Atlanta Falcons Linebacker, Buddy Curry, in Davie and Davidson counties the weekend of May 16-17. The clinics are offered free of charge to all youth athletes in the area in memory of Matt Gfeller and his love of football. Wake Forest Baptist Health-Lexington Medical Center and Wake Forest Baptist Health-Davie Medical Center are community supporters and will provide safety education for parents. Space is limited for these events. Athletes and parents interested in the event must RSVP on the Kids & Pros website at www.kidsandpros.com under the camps and clinics tab. In addition to the clinic, there will also be a free parent information session open to all youth recreation and school coaches and parents interested in learning more about: the impact of a coach as a role model, character building through football, equipment fitting, concussion avoidance, and Heads Up FootballSM (the steps of proper football tackling technique and other skills to avoid injuries). Curry, a USA Football Master Trainer, incorporates safe tackling techniques from USA Football’s Heads Up FootballSM program into his clinics along with life skill lessons. The safe, non-contact football instruction teaches campers, parents and coaches the right way to play and how to avoid injuries, like concussions. Life threatening injury is the No. 1 killer of kids in America. Nearly 10,000 children lose their lives every year from serious injuries, and many more are treated in the emergency room. It can happen anywhere, at any time, to any child. The Childress Institute for Pediatric Trauma discovers and shares the best ways to prevent and treat severe injuries in children. The Institute funds research, education and advocacy to help improve the care and treatment injured kids receive across the U.S. The Matthew Gfeller Foundation was founded in memory of Matt, who died from head injuries sustained in his first high school football game in August of 2008. Our mission is to help parents prevent, recognize and treat youth sports head injuries. We support the role athletics can play in our kids’ lives, but believe that head injuries can be minimized through better equipment, training, diagnosis and early treatment. We simply want kids to play it safe. Visit our site to learn more. About Kids & Pros, Inc. Kids & Pros, Inc. is a non-profit organization, started in 2002 by former Atlanta Falcons Bobby Butler and Buddy Curry in order to teach character and skills through athletics. 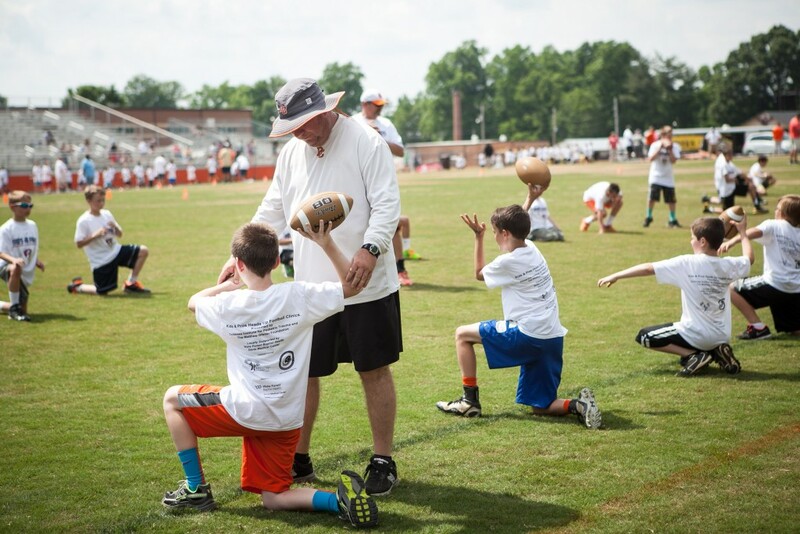 Through its unique football experience and combination of athletics and wellness education, the organization now provides weekly youth football camps, clinics and football safety training across the Southeast. Kids & Pros is an official LICENSED PARTNER OF HEADS UP FOOTBALLSM For more information on Kids & Pros, Inc., please log onto our website, follow us on Twitter @kidsandpros, or connect with us on Facebook at Kids & Pros, Inc.
Wake Forest Baptist Health – Lexington Medical Center, with 94 acute care beds, is part of Wake Forest Baptist Medical Center and operates14 hospital-owned physician practices and a public pharmacy. The hospital is accredited by The Joint Commission, the nation’s esteemed standards-setting and accrediting body for health care quality. Lexington Medical Center serves as a satellite provider of Wake Forest Baptist Health specialty services including digestive health, urogynecology, neurosurgery, emergency medicine, and ENT Head and Neck surgery among others. Wake Forest Baptist Health − Davie Medical Center is a state-of-the-art medical campus that features a physician office building, outpatient surgical center and 24/7 Emergency Department, as well as a sleep center, rehabilitation, imaging, laboratory and pharmacy services. Davie Medical Center offers the nationally ranked care provided by Wake Forest Baptist Medical Center in a convenient location at the intersection of Interstate 40 and state Highway 801 in Bermuda Run.